Electronic and Photonic Circuits and Devices brings you a valuable overview of both the current practice of circuits and devices as well as the latest design trend toward photonics technology. In one convenient source, these selected papers reprinted from the IEEE Circuits and Devices Magazine present the important concepts behind future devices and the likely direction of optoelectronics in the next twenty-five years. Organized around a key paper by Anthony DeMaria, Electronic and Photonic Circuits and Devices offers you a clear presentation of how research and design in this field is moving from the current use of wholly electronic circuits and devices toward a future of exclusively optical applications. You will also learn the fundamentals of new optical manufacturing and optical systems. 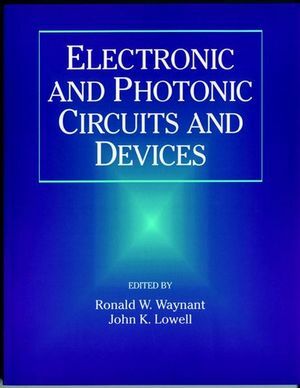 Electronic and Photonic Circuits and Devices is essential reading for graduate students and engineers who want to gain a strong background for understanding future developments in this dynamic area. Ronald W. Waynant is a senior optical engineer for the Food and Drug Administration and an adjunct professor at Catholic University, Washington, D.C. He has published more than 60 journal papers and has given more than 70 presentations. Dr. Waynant holds seven patents, has edited three books, and taught numerous short courses for both the Institute of Electrical and Electronics Engineers and the Society of Photo-Optical Instrumentation Engineers. Since 1985 he has served as editor-in-chief of the IEEE Circuits and Devices Magazine. John K. Lowell is a visiting scholar at the NSF Center for the Synthesis, Growth and Characterization of Electronic Materials at the University of Texas at Austin. He is currently the elected Secretary of the IEEE Electron Devices Society. Dr. Lowell has published more than 100 papers, holds six patents, and has five patents pending. Most recently, he received a Technical Achievement award from the IEEE Lasers and Electro-Optics Society Central Texas chapter. Since 1985, Dr. Lowell has served as the associate editor-in-chief of the IEEE Circuits and Devices Magazine and served twice as guest editor. Integrated Circuit Manufacturing and Novel Circuit Design. Optoelectronic Integrated Circuit Device Technology.